The YWCA Darien/Norwalk has announced the six honorees for the sixth annual Women of Distinction Awards and Luncheon on May 7. The distinguished honorees are Sandy Nielsen Baumann, Alicia Sillars, Dr. Josephine Velazquez Rucquoi, Jane Yezzi and Susan Delaney. Merlyn Tejada will be honored as a Young Woman of Distinction, recognizing the outstanding accomplishments of a woman under 21 years of age. The Women of Distinction Award is given in recognition of the outstanding achievements of a select group of women. Local residents and business owners nominate women whose significant and unique contributions have made a difference in the Darien and Norwalk communities. The YWCA Darien/Norwalk Women of Distinction Nominations Committee reviews the nominations and selects the honorees. "Women frequently work behind the scenes to forge stronger families and communities," event co-chairwoman Ellen Bay said. "We at the YWCA are grateful for the opportunity to shine a light on these women and celebrate the differences they make every single day." Added co-chairwoman Louisa Stead: "The 2015 Women of Distinction honorees embody the meaning of selfless service. Through their generosity and dedication to their communities, they are true leaders and role models." Baumann is an integral part of a family business that has been in the Darien community for more than 70 years. As general manager of Nielsen's Florist since 1992, she has not only been instrumental in implementing strategies for this business that has spanned four generations, but has taken the opportunity to further her deep-rooted connection with community service. Over the years, Sandy has sponsored numerous sports teams, from hockey to baseball. After Superstorm Sandy, she organized Team Nielsen and collected supplies to be driven to Coney Island victims in need. She has sponsored multiple Eagle Scout projects and the Depot Teen Center, and continually opens her doors to many local organizations, including the Food Bank of Lower Fairfield County, Post 53, Darien Land Trust, the ABC House, and Five Mile River Nursery School in Rowayton. Last year, she hosted "Bras for a Cause" at Nielsen's, raising money for breast cancer awareness, as well as the YWCA's sixth annual "Cookies for a Cause." In addition to providing charitable support, Baumann is involved with many civic organizations. 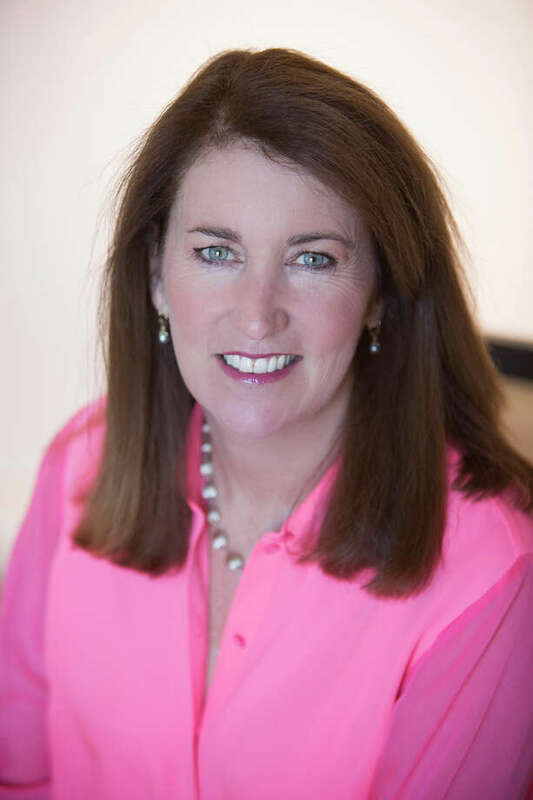 She served on the board of directors of both the Darien Chamber of Commerce and at the Darien United Way, working with many agencies that they fund. She also has been actively involved with both funding and employment for STAR Inc., a nonprofit organization benefitting the mentally disabled. In 2011-12, she was on the Community Fund Business Campaign Leadership group and currently is on the Program Committee for the Fund for Women and Girls, and on the board of directors of the Connecticut Community Bank. According to Judy Nielsen, who nominated her for the award, "Sandy exemplifies the adaptability and dedication required to weather the changes we have all faced over the past decade. Nielsen's Florist is interwoven with Darien, helping customers in times of sorrow and joy, and giving back to the local and regional community." Described by her friends and colleagues as a "patient teacher, an understanding listener and a dedicated advocate," Delaney has been a domestic violence victims' advocate for nearly 25 years with the Domestic Violence Crisis Center. Susan's compassion and empathy are evident in the multifaceted work she does with both victims and the broader community. Her relentless advocacy and unyielding support for victims and their families has been described as "a gift." She has provided a range of support including on-site crisis counseling, counseling for safety planning, providing information about legal advocacy and regularly operating the overnight shift for the DVCC hotline. Susan's ability to consistently manage crisis situations is exceptional. "Too many victims to count have been fortunate to find comfort in her ability to listen, defuse and present options in often what are devastatingly frightening situations," said Debbie Fryer, a former PeaceWorks Coordinator, in Susan's nomination for the 2015 Women of Distinction Award. Delaney envisioned and launched the DVCC Medical Advocacy Project, where she has personally trained more than 1,400 medical staff in hospitals on how to identify and support domestic violence victims. She also has provided extensive training and seminars to professional groups, social service agencies, faith communities and law enforcement. In addition to her work in domestic violence, Delaney has also been the driving force behind the Teen PeaceWorks program at Darien High School. Through workshops she developed and presented, children have learned about peace, empathy, tolerance and respect, as well as the difference between healthy and unhealthy relationships among young adults. This important educational program typifies Delaney's creative, compassionate and practical approach to tackling some of today's darkest social issues. "Dr. Jo," as most of her patients call this local podiatrist, generously supports just about everyone she meets. Her many acts of kindness are countless, as she has opened her heart and home to many, providing care, transportation, prayer and financial help to those in need. As a doctor, she cares for much more than her patients' feet. She listens to them, provides relief, gives hope that what ails them will get better, and even offers them the comfort of prayer. Rita Ferri, principal of Hindley School where Josie's three children attended elementary school, wrote, "Josie is a kind and caring physician. She travels to nursing homes and gives her love and attention abundantly to the elderly patients who eagerly await her visits. She spends time to know her patients well and treats them with dignity and great care." Rucquoi's generosity extends far beyond her practice as a physician. Her home is a welcoming refuge for young people who are struggling and her caring support has included fostering three little girls in addition to raising her own children. Rucquoi, along with Dr. Maryann Lehmann and two other doctors, founded Doctors4Darien, a group that educates the community about healthy living through local forums. She also runs road races as part of promoting a healthy lifestyle. She has contributed important information to presentations at The Depot, and acts as a role model for young women, working as an Elder in the Hope Church with teens and singles. She has worked as a Civil Air Patrol leader and regularly participates in events at the Carver Center in Norwalk, the annual Veterans' share at Hindley Elementary School and Veteran's Day parades, marching in her Air Force uniform. Lehmann, one of the many people who have nominated Josephine, said, "Helping others. ... To say that this is the theme of Josie's life is an understatement. ... We should be proud to have Dr. Josephine Velazquez as part of our community." Sillars' commitment to Darien's youth has been her passion and focus for nearly 25 years. In 1990, she became the first director of the newly created Depot Teen Center. It was a unique opportunity to experiment and Alicia developed innovative ways to create a safe, fun and engaging space for Darien's youth. From the Depot, Alicia moved on to be the director of the Darien Youth Commission. For nearly 20 years, Alicia has been spearheading family-friendly activities and programs that unite the community in Darien. Her fresh thinking and ability to connect with young people and families have seen Darien celebrate everything from the Community Arts Festival, to the Family Concert Series, the Tilley Pond Model Boat Regatta and the Holiday Movie and Gift Drive benefitting Human Services. Providing healthy, fun and safe options for children and teens is an important and consistent focus for Sillars as she has continued to develop programs for TOPS (Teen Options) and the Youth Commission summer camps. Alicia provides leadership for a wide variety of evening and weekend activities in partnership with numerous organizations and agencies, including close to 400 volunteers annually. "Alicia makes it easy for everyone to participate and volunteer," said Geoffrey Ball, chairman of the Youth Commission, in his nomination of Sillars. "Darien is a better family community because of her efforts." Her commitment to young people extends beyond her current role; she is a Depot Adult Board Community Member, member-at-large of the YWCA's Parent Awareness program; member and current co-chairwoman of the Thriving Youth Task Force, a coalition of parents, professionals and teens in the community committed to the growth of life skill development to minimize risky behaviors. Sillars' leadership not only demonstrates her strong dedication to the healthy development of young people, but her willingness and ability to mobilize the community to work as one collective voice. Tejada requires three things of herself. Namely, that she gets every job done right, that she works hard, and that she enjoys her successes along the way. Tejada is a scholar resident in the Darien A Better Chance program, where she quickly distinguished herself as a leader with her strong work ethic and unwavering positive vibe. She hails from the Dominican Republic and, more recently, from the Bronx, N.Y., where she lives with her mother and two siblings. She moved to the ABC house in 2011 to further her education and is currently a senior at Darien High School. As a 2014 National Honor Society Inductee, Merlyn mentors and guides her younger ABC peers and has served as a volunteer tutor to other Darien High School students. Merlyn's passion is in the sciences and the interconnection of living things. With lots of options and lots of intellectual talent, she hasn't picked her major. The environmental sciences beckon, as do international affairs and pre-law. A whirlwind of energy and enthusiasm, Tejada volunteers at Person-to-Person once a week. Spanish being her native language, Merlyn is the perfect person to greet Spanish-only speaking clients at the reception desk where she translates their needs to other volunteers. Tejada is also very involved in extracurricular activities at the high school. She is in the Environmental Club, Gay Straight Alliance (a support group for anyone), serves as a Big Sister mentor for incoming freshmen and is a class representative in community council. Somehow, Tejada also finds time to intern at Darien's Rucci Law Group. Katie Egan, resident director of ABC, says it all. "Merlyn is an excellent example of a well-rounded, determined young woman and has an extremely bright future ahead of her." "A Better Chance" could easily be Yezzi's personal motto and exemplifies the contributions she's made to academically underserved youth and struggling families in the Darien and Norwalk area. Yezzi has been the co-president of A Better Chance in Darien since 2009 and a board member since 2007. Under her leadership, the academic and boarding scholarship program for young women of color has undergone significant transformation. "Though it takes a village to operate the ABC program, we know that it takes leadership, dedication and many hours of back-breaking work by those closest and most committed to ensure success," said Vyvyan Burns, former executive director of ABC Darien in her nomination of Yezzi. "Jane, in her understated way, has led by example and has been one of the key individuals that helped accomplish so much for the ABC program." With the completion of a new strategic assessment, a capital campaign and a new house purchase and renovation, it is clear to see the invaluable contribution Jane has made. Jane has run the annual Postal Food Drive for Person-to-Person for more than a decade. The food drive yields more than 30,000 pounds of food and replenishes the emergency food pantry. She serves as a shopper at the Food Bank of Lower Fairfield County and dedicates time to train Person-to-Person volunteers to do the same. Jane also runs a holiday giving program, "Be a Santa," for P2P, which enables employees of local companies to purchase basic clothing, layette items, linens and other household items during the holidays to support clients. Many working families in the broader community struggle to meet their basic needs, such as food, shelter and financial obligations. As a member of the Community Fund of Darien's Allocations Committee, Jane shares her knowledge and expertise to support many of the local social service agencies in meeting these needs. While many have described Jane as quiet and someone who prefers to work in the background, there is no doubt her leadership and dedication to her community is high volume and impactful. The Women of Distinction Luncheon takes place at Woodway Country Club from 11:30 a.m. until 1:30 p.m. Tickets for the luncheon will go on sale the first week of May and can be purchased in person at the YWCA Darien/Norwalk office at 49 Old Kings Highway North in Darien, by calling 203-655-2535, or by visiting ywcadariennorwalk.org.